Jill Jill Stuart two-tone colorblock dress. Approx. 47"L from shoulder to hem (size 4). 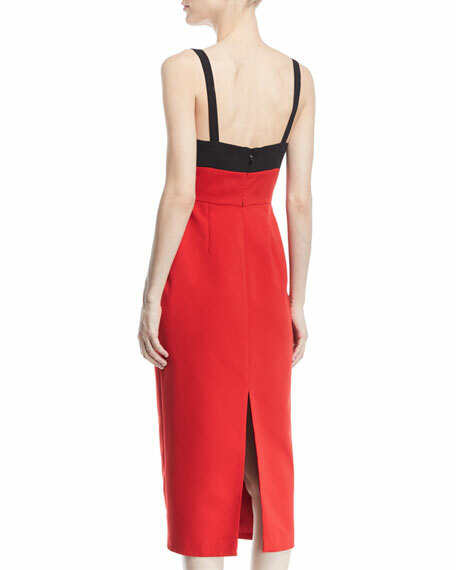 Deep V neckline; square back. Model's measurements: Height 5'10"/177cm, bust 31"/79cm, waist 24"/61cm, hips 34"/86cm, dress size US 0/2. Founded in 2010, Jill Jill Stuart features an elegant collection of evening gowns and cocktail attire. The line includes a variety of pieces for special occasions, highlighting bold colors and quality fabrics. With slimming, structured silhouettes, the brand combines modern cuts with classic style, creating unique designs for the everyday woman. For in-store inquiries, use sku #2496631.